The Defender® Gutter Spike is a pigeon control device designed to keep pigeons out of gutters. The gutter can provide the perfect roosting and perching place for pigeons. Birds love to nest and roost in high up areas. This gives them the advantage of spotting suitable feeding sites, while also keeping an eye out for dangerous predators. The gutter has the added bonus for the pigeons of being curved, which keeps the nesting materials nicely in place. However, nests can block the gutter causing flooding and water ingress to the property. The Defender® Gutter Spike simply clips onto the outer edge of the gutter, providing a barrier against pigeons trying to gain access and will easily stop birds in gutters causing damage, whilst still allowing for free-flowing water beneath. All our Defender® spikes are made by us, Jones and Son Pest Control Supplies, in Devon. If you in the area and have a pigeon spike question, call in to chat with our friendly team and learn how our spikes are made. Each piece of Defender® Gutter Spike is 33.4 cm long (13 inches) This means 3 strips are needed to protect a metre of guttering. It is essential to use gutter spikes in all the guttering around the home to completely proof the building from nesting and roosting birds. 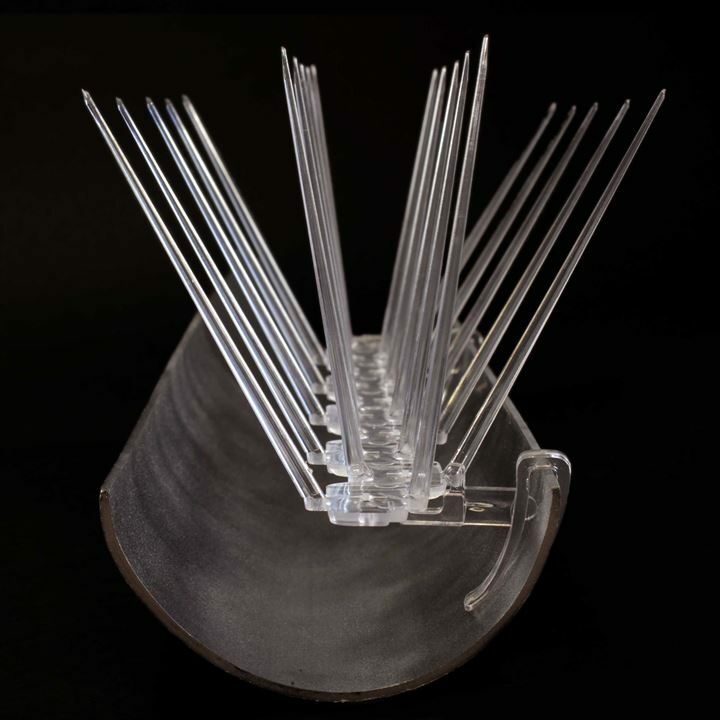 Each gutter spike is made up of a 4 rows of 5 pins, which fan out at different angles making it virtually impossible for birds to gain a foot hold on or near the Defender® Gutter Spike. The front of the average terraced house has about 5 metres of standard gutter. 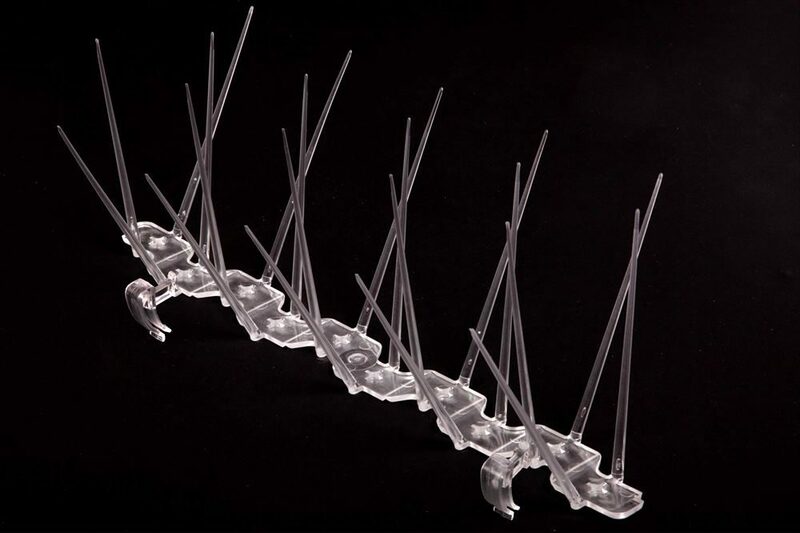 Therefore 15 pieces of Defender® Gutter Spike would be ample to keep pigeons out of gutters. Jones and Son Pest Control Supplies Ltd developed the Defender® Bird Control range with being humane in mind. In fact pigeon spikes are recommended by the RSPB as the best bird proofing system. Once the gutters have been protected against pigeons using Defender® Gutter Spikes, the birds attempting to land in the gutters will find it uncomfortable and move on to more accessible areas. This easy and quick to install Defender® Gutter Spike simply presses onto the guttering lip, using the integral plastic clips. The clips are placed on the outside edge of the guttering, which positions the bird spikes in the centre, keeping pigeons out of gutters. The Defender® Gutter Spike will fit all standard half round or square plastic guttering or hoppers that do not have a lip or ornate design on the front edge. The gutter spike has 2 clips attached that just slip over the edge of the gutter. This mechanism places the gutter strip in the centre of the gutter. However, as it "hovers" above the base of the gutter, it allows for the free flow of rain water beneath. Defender® Gutter Spikes, by nature of this pigeon proofing product, are open to all the elements. For this reason, a UV polycarbonate plastic has been used to manufacture them that will not yellow or become brittle in direct sunlight or extremes of temperature. The Defender® Gutter Spike can be fitted into position without the use of silicone so, when it comes to cleaning gutters, it can simply be lifted off and then replaced. Therefore there is no need to purchase new spikes every time the gutters need maintenance. Every strip of Defender® Gutter Spikes comes with 2 clips pre-attached for easy fixing to the gutter. Along the actual base of the gutter spike, there are 8 grooves which make it snappable to smaller sizes if needed to finish a run of gutter, or fit to a smaller hopper. The clips can be carefully pulled off and re-attached further along the strip by just clicking into the required position. 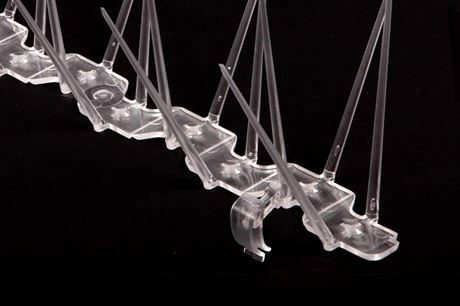 Our Defender® Gutter Plastic Pigeon Spikes are made from super tough Durolon UV stabilised polycarbonate. This type of plastic is used as it will not discolour or become brittle in direct sunlight and extreme weather conditions, and will stay strong in the varying temperatures we experience throughout the year. High quality, this bird spike will be around a lot longer than most other pigeon spike products available on the market, and comes with a Product Warranty of 15 years for extra peace of mind and confidence. All Defender® Gutter Spikes are made in the UK using only the highest quality materials. Jones and Son Pest Control Supplies Ltd pride themselves on the manufacture of quality bird spikes and plastic pigeon spikes that will keep birds off your property, business or home - or, in this case, keep pigeons out of gutters. As a family run business, Jones and Son place huge emphasis on our customer service and our ability to provide pest control products that solve your bird problems. If you would like to see just how easy it is to install Defender® Gutter Spikes, please click here to view the printable online guide for installation: Defender® Gutter Spikes. Please be aware that, due to the positioning of gutters in and around the home, it is advisable to seek professional help when installing Defender® Gutter Spikes if you are not proficient in the use of ladders at the height of gutters. Our Defender® Gutter Spikes for birds and pigeons have kept birds out of gutters for countless of people around the world. See for yourself and read our wonderful Bird Spike and Pigeon Gutter Spike Reviews. If you have a "How to keep pigeons out of gutters" question, please do not hesitate to contact us and we will be happy to advise on installation, and give guidance as to which products you require to stop birds in gutters. (Mon - Friday 8.30am - 4.00pm).